Crawling out from under a rock in a swamp, scumbag and Democratic Party favorite Louis Farrakhan visited Iran where he led chants of “Death to America,” and “Death to Israel” during a speech in Tehran. The anti-American, anti-Semitic Farrakhan flew to the Middle East recently to display support America’s enemy, Iran on the 39th anniversary of 1979 US embassy takeover on November 4 and the day before the reimposition of US sanctions against the rogue regime. 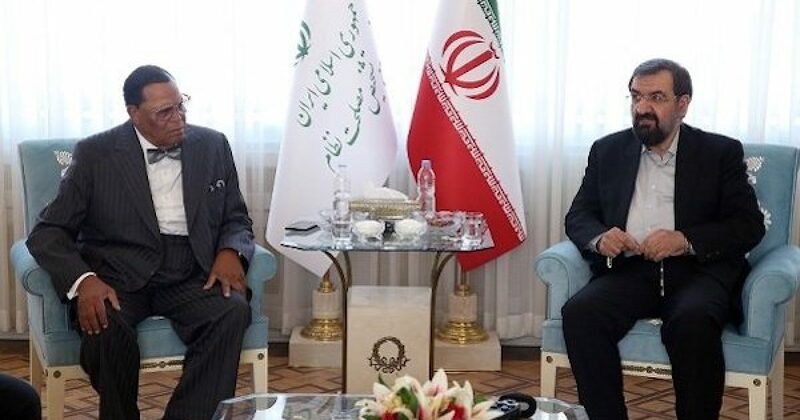 Farrakhan also gave a speech during a meeting with the Secretary of Iran’s Expediency Council Mohsen Rezaei in which he claimed America is constantly conspiring against Iran, per the Jerusalem Post. In his speech in Tehran, Farrakhan said he was enjoying his visit to Iran and that “I am here to show my friendship” with the Iranian people. He also warned Iranians against “American plots” against the Muslim world. Farrakhan also referred to the killing of Saudi journalist Jamal Khashoggi and to Trump and his Jewish son-in-law Jared Kushner’s involvement in Saudi affairs. “When I met Saudi Prince Bandar bin Sultan al-Saud at the Saudi Embassy, I asked him why there are American troops in the holy places [Mecca and Medina],” Farrakhan added. “He assured me that we have a treaty stating that any time we want, we can remove the Americans. I told him that treaties have not stopped the Americans in the past. They also had treaties with the Native Americans, which were never honored. This supposed American travels to an enemy state and grants aid and comfort to that enemy…shades of Jane Fonda. Even when in the US Farrakhan is trashing the nation which gives him wealth and freedom. In the past, he has said things such as The CIA Created Ebola and Aids To Kill Off Black People, Your Record America Stinks In The Eyes of God, 9/11 was Fake America Was Looking for a New Pearl Harbor, and much much more. But making matters worse Farrakhan is supported by some members of the Democratic party in the US. And the ones who don’t support him are silent. As they say in Italian “Chi tace acconsente,” silence means consent. Pictures and video released earlier this year, revealed that former President Obama and other Democrats including Maxine Waters (D-CA), Al Green (D-TX), Barbara Lee (D-CA), and seventeen other Democratic members of Congress had very friendly meetings with racist, anti-Semite Louis Farrakhan. The Deputy Chairman of the Democratic Party Keith Ellison had a closer relationship with the bigot whose hatred’s been displayed throughout his long career. Farrakhan’s hatred isn’t the only issue. Whenever a bigoted nut-job announces support of President Trump, Democrats, and the mainstream media rush to interview every Republican they can find, “why won’t the president denounce—?” David Duke and the Charlottesville Neo-Nazis were only two of the many examples of this behavior. I’m a pretty global individual. So I know Farrakhan, I know the Middle East question, I know the Jews and Farrakhan—I know all that, but that’s not what I spend all my time focused on. … I know Farrakhan, been knowing him for years and years and years and years and years, and every once in a while some writer or somebody will I guess try to think of something to say about Farrakhan, but nah, my world is so much bigger than any of that. I don’t have time for that. I deal with it, you know, when it comes but nah, that’s not a real part of my focus. The Chicago Democrat told the DC that he is friends with Farrakhan and sees no reason to apologize for that. Outstanding human being? I wonder if Chuck Schumer or Nancy Pelosi agree with him? Probably not because hatred of the Jewish people has become a staple of the Democratic party. Neither Schumer, Pelosi or any other Democratic Party leader has comment on the party’s friendship with Farrakhan or the their leap toward Antisemitism. That’s because no one in the biased MSM will ask. Sometimes media bias has nothing to do with what reporters say, but what they don’t ask.